The recent Eviction Notice by the Sub-Divisional Officer/SDM, Bishnupur around the Macha Ebemma Khudithibi (MEK) area has made the people of the area, specially the local Meeteis and Kabui tribes, worried of losing their age old beloved lands to the project proposal of a Technology Centre for Fragrance and Flavor to be set up by the Commerce and Industries, Govt. of Manipur. In the backdrop of the tension in the hills of Manipur, MEK area can be regarded as one of the most peaceful area, where the Meeteis, tribal and other communities of Manipur live harmoniously since time immemorial. MEK area is 33km South of Imphal and is 3km west of the Ningthoukhong Municipal Town, which is on the NH-150. It is at the foothill of the Laimaton and Thangching hill ranges, which was famous for its role in the World War-II, fought between the British and the Japanese. The aerial distance of MEK from Loktak Lake is about 4 km, separated by the vast agricultural land. The area (about 60 hectares) is surrounded by prime paddy fields, various native trees species (some are more than 100 years old) such as State tree Uningthou (Phoebe hainesiana B. ), Uyung (Quercus serrata L.), Usoi (Schima wallichii L.), Teak (Tectona grandis L.), Leihao (Magnolia champaca L.), Wang (Gmelina arborea L.), Yendang (Cycas pectinata), agro-forestry farms and medicinal plants. Historically, MEK area falls under a sacred place of Manipuri’s local deity called Macha Ebemma Khudithibi, daughter of the famous Epudhou Oknarel, elder brother of the king Moirang Thangching. Oknarel came towards tribal village called Sadu Khuroi, after a conflict with his younger brother. He married to a Sadu (Kabui tribe) woman and descended towards the valley of Ningthoukhong. When Oknarel came down to Ningthoukhong with his family, his only daughter accidentally struck a stone with her feet, fall-down on the road and died. 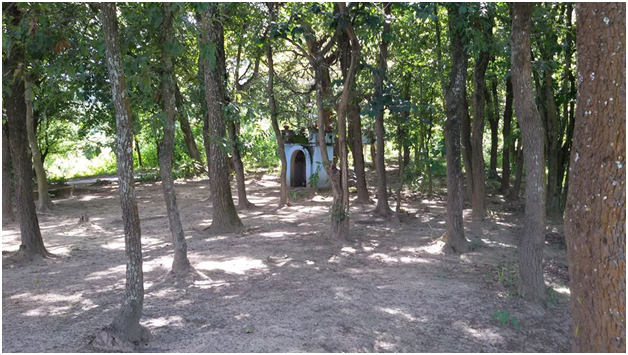 The place where she died is now well preserved with lush green woods, trees, flowers and Sacred Groves. Tombs and worshiping places are erected by the local people of Ningthoukhong at the site. The area is developing in true spirits of Manipuri’s historical backgrounds. MEK is proposed to be included in the “Natural Heritage Sites”. The area is naturally bestowed by indigenous flora and fauna of Manipur, which is also an ecological niche with very high biodiversity. Agriculturally, the area produced many tons of rice every year and served thousands of people of Manipur. The area is potentially high for tourism and can cater to bring tourists from whole over the World to Manipur by exhibiting its unique natural, cultural and ecological environment. It can serve as educational sites for children. The area can also empower both the youth and women of Manipur by employing them in agricultural, horticultural and tourism activities. On dated 13th January 1950, the Forest Officer, Manipur, issued order (F. Misc. Case No. 1223/48/49) to the effect that the land under Dag No. 9 of Village No. 44-Ningthoukhong Kha is not included in the Forest Area of the Manipur’s reserved forest. Khundrakpam Phulinkanta, former Revenue Minister, Govt. of Manipur, De-reserved the area as homestead and agricultural land on December 1984. Prajatantra Imphal newspaper published the said decision of the Govt. of Manipur on 24th December 1984, mentioning the de-reservation of 43 and 44 Ningthoukhong Kha. On the same day, other hills and valley areas of Manipur viz. Moreh, Churachandpur, Kwakta, and Khoupum Valley were also de-reserved by the Cabinet Ministers, Govt. of Manipur. After de-reservation, the farmers of the area acquired the land pattas allotted to them; however, marginal farmers were not able to procure it due to their financial and personal constraints. Thus, the areas have both Pattadars and Dag Chitha holders. Relevant documents of the farmers and official government maps were burned to ashes during the July 2004, Manipur’s agitation on Manorama Devi issue. Since then (11 years), the documents of the area were never updated/processed by the revenue officials. Poor farmers were kept in dark and run from post to pillar to get their land documents. However, the officials announced the farmers as trespassers in their own land and declared the area as Khas Land. On the other hand, it was found that some of the officials of SDC-Ningthoukhong issued computerized land Pattas and Dag Chitha to migrants, while indigenous people were left-out. Sub-Divisional Officer/SDM, Bishnupur, on 10th September 2015 served a “Notice of Eviction” to the poor farmers of the 44-Ningthoukhong Kha, within 10 days from date of proclamation of the order. The notice was delivered to the farmers on the evening (6.30pm) of dated 18th September 2015 by the Officer Incharge (OC) of the Loktak Police Station, giving the farmers a single working day of Saturday, 19th September 2015. On 21st September 2015 morning, the houses of the poor farmers were destroyed and evicted in a war-like situation, using many well equipped Police Personnel’s. At this juncture, it is questionable, whether the mono-culture plantation of Lemon Grass (Cymbopogon citrates) and Shangbrei (Pogostemon purpurascens) and employments of few people for the development of Technology Centre for Fragrance and Flavor, is better than destroying the rare and indigenous plants, wild rare orchids, native trees and paddy fields of this ecologically fragile Manipur area? The indigenous people of the MEK area are harmoniously living socially and culturally with their natural environment. The area is the only aesthetic and recreational part around Ningthoukhong. The people continue to preserve and manage MEK with their traditional indigenous knowledge, which was passed on to them by their ancestors. Therefore, actions that may violates the guidelines of indigenous people’s rights, including illegal eviction, internal displacement, termination of right to possession, right to livelihood, right to education, right to health, right to water etc. must be avoided. The present eviction will directly affect 100s of people, homestead land, religious sites, sacred grove, agricultural and agro-forestry lands, fragile ecosystem and cultural integrity of Manipur. Looking at the current scenarios, the project proponent/s should meticulously conduct “cost benefit analysis” of whether the project will, in the long run, be feasible and beneficial to the stakeholders. There is also a need for a social impact assessment (SIA) by the project proponent/s. It is imperative to mention here that, in recent years, there is a visible change in the climatic condition of Manipur. This resulted in the losses of Crores of rupees from the State exchequer and the common people suffer. Thus, climate resilient programs of afforestation of MEK area and developing it in line with the “Act East Policy” of India, such as tourism, organic farming, agro-forestry, herbal and medicinal plants productions etc. will bring more sustainable development of not only MEK area but also the state of Manipur in the near future.